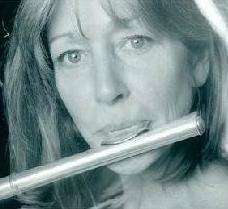 Join jazz flutist Ali Ryerson and her group this Saturday May 7th at Becky Ogden’s 5th avenue Bungalow Jazz house. This is the first show and one of many great jazz performances to follow this season at Bungalow Jazz. Joining Ali Ryerson are Steve Rudolf on piano and Stan Smith on guitar. Show time is 8pm and admission is $20. Ali Ryerson has emerged as one of the most exciting and versatile flutists on the scene today. She has performed with such diverse talents as Dr. Billy Taylor, Kenny Barron, Stephane Grappelli, Frank Wess, Red Rodney, Laurindo Almeida, Art Farmer, Maxine Sullivan, Roy Haynes, Julius Baker, and (as principal flutist with the Monterey Bay Symphony) with Luciano Pavarotti. Ali has toured the USA, Canada, Europe, Japan and Africa, and has performed in many major jazz festivals, including the famed Monterey Jazz Festival, the JVC in New York, Guinness Festival in Scotland, Edinburgh Festival in Scotland, and Carnegie Hall. Ali has released over a dozen jazz albums, the first four on European labels. She was then signed by legendary record producer Bob Thiele who produced two albums on his Red Baron label. Ali then signed with Concord Jazz for an additional three recordings. Jazziz put her Concord debut album on its Critic’s Picks for 1995. Ali conducts jazz flute seminars at many schools and unversities throughout the country, including Ohio State University, the University of Alaska, Capital University in Columbus, Ohio and the Western Connecticut State University Summer Flute Institute. Hidden Valley Music Seminars in California presents Ms. Ryerson’s annual week-long jazz flute master class the first week in July. Ms. Ryerson is a Brio Performing Artist and Clinician for Gemeinhardt.